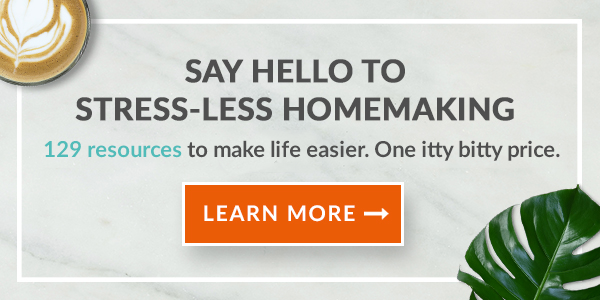 I’m excited to tell you all about the Homemaking Bundle from Ultimate Bundles. Have I purchased this bundle in the past? Yes! Do I every year? No! It’s not right for every person every year. than retail price! So maybe you wanna give it a look? Let’s see if the bundle is for you this year! If you’ve had your eye on my freezer meal club ecourse, this bundle is for you! The course retails at $49.99 and I’m convinced it’s worth every penny and more. You’ll save at least that much during your first month of a club and more thereafter. But just during the bundle sale, you can get it for the bundle price of $29.97. That’s right, the bundle costs less than my course! Now is the time to grab it up while you can at that price. I have no plans to ever offer it for that low price again. So if all you wanted was my a course, you’re getting quite a deal. But of course, you also have access to many other resources. 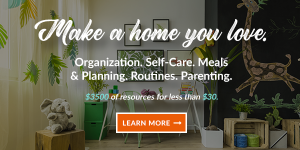 You will get 129 eBooks, eCourses, and printables designed to help you declutter and organize your home, balance your many roles, meal plan and serve healthier meals, plus resources for parenting, marriage, working from home, self-care and much more. 98% off. For one week only. Do you need 129 resources? Probably not. In fact, I admit I did not have time to thoroughly read every book or complete each course. Who does?! This bundle is a value if you find just a few really useful resources that are pertinent to your life right now. Of course, you may go back and find other resources later that are helpful. I know I have. If you want to see each and every resource listed in every category, click here. 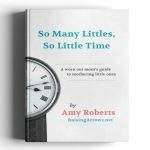 You’ll find lots of great information about kids and chores, meal planning, working at home, decluttering, homeschooling and family life. And more. Here are a few resources that I really loved. It certainly does not mean that the others aren’t awesome. These are just the ones that caught my eye for one reason or another and then kept my attention the entire way through. As you all know, I’m a huge fan of Plan To Eat and use that for most of my recipe storage and meal planning. But this course focuses on using Evernote, which is a tool I’ve been using for about a decade and can be used for so much more than recipe organizing. And I do still store some recipes using Evernote. This course is great in that it will give you a comprehensive look at how to use this extremely useful tool in many different areas of your life. Great strategies for always being prepared for a meal with just a little prep. This book gave me some ideas I’m sooooo gonna try! This lady thinks like I do, I guess! 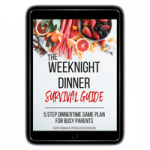 I liked that this book really explained the best (and what I consider foundational) sanity-saving meal planning strategies that can work for absolutely everyone, no matter the diet or budget. This includes getting the family involved in easy ways with food preparation. You know I’m a fan of that! This book is NOT about recipes but about how to better approach dinner prep. I’m pretty picky when it comes to cookbooks. And most recipes collections don’t offer me much in the way of “new and exciting”, while using whole foods ingredients that aren’t too expensive. 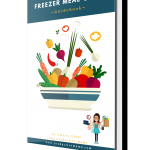 If you aren’t going to take my advice on starting a freezer meal club [insert frustrated face emoji here], then get this book! Because I highly encourage a strategic leftover plan. Except that with these recipes from Green, your family won’t see them as leftovers. Honestly, I think Ms. Green has underpriced her book. 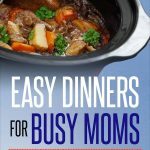 These recipes are great and included some unique ones that I can’t wait to add to my repertoire. Let’s just say one involves lemongrass! I’ve mentioned my use of chore cards in my video on getting kids involved with household chores. If you are crazy uncrafty like I am, this is a great tool. 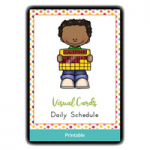 This is not just for chores, but also to help kids visually organize their schedules, plan their days and even ease those transition times that can be challenging. 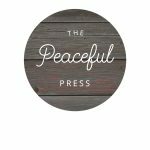 This is a great printable for anyone with pre-readers! You’ll be able to hit the ground running with these. Another printable set of chore cards that are well worth the money! Like the cards above, these are awesome for establishing good and healthful habits. 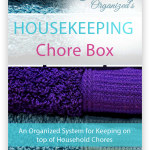 One great feature of this set is that it includes step-by-step instructions for many of the common chores your children need to do. And breaks them down into simple steps that they can easily follow. Either one of these sets of chore cards would be of great benefit to your family. And you will get both of them! Lucky you! Another chore system (more for you than the kids) using printable daily, weekly, monthly and seasonal cards to help you keep you on track. Easy to customize and implement. You can get going right away with the prefilled tasks or really make it yours. And you put the cards in a super cute box that you make from the provided template. It actually looks manageable for even this non-crafty productive mama. Well, I didn’t even have that many little ones, but I know I would have enjoyed this resource when I had 3 kids 5 and under. When you’re in the midst of it, it’s hard to find the joy but this resource reminds you to do so and gives you practical ideas to navigate that stage of life. This is but a tiny handful of the many resources available. I did not even touch on the ones relating to finances or working at home. Again, you will not use or even look at half of what’s available. But if you find a few titles that you really want and they add up in price to more than the cost of the bundle, then the bundle is a value for you. If you don’t see anything that you really have a strong desire to read, well this year the bundle is not for you and that’s okay. Homemaking Customer Testimonials from Ultimate Bundles on Vimeo. Previous Post:I avoided Costco for years – but now? Next Post:Sunscreen – friend or foe? Go cheap or break the bank?